Our Store-wide Sale starts tomorrow Friday 8/19/16 at 10 am and runs through 5 pm on Sunday 8/21/16. 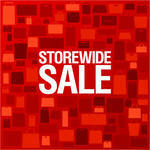 Up to 50% or more off select items !! Now is the time stop in early to pick up the special treasure you have been watching!